The meeting of the House of Bishops this week at Camp Allen in Navasota, Texas may prove to be an historic turning point in the life of the Anglican Communion. The Bishops overwhelmingly rejected a “Pastoral Scheme” that was proposed by the Primates of the Anglican Communion at their February meeting in Dar es Salaam, Tanzania. By doing so, the bishops reaffirmed that the Episcopal Church is a self-governing, autonomous church, and that it is not divided. We also served notice that we cannot accept intervention in the governance of our Church by foreign prelates. In addition, we affirmed very strongly our passionate desire to remain in communion with other Anglican churches across the world, and we adopted a unanimous resolution, introduced by the Rt. Rev. John Howe, the Bishop of Central Florida and leader of the more conservative bishops, asking the Archbishop of Canterbury and the Steering Committee of the Primates to meet face to face with our House of Bishops at the earliest opportunity. We believe that many foreign primates do not have an accurate sense of the Episcopal Church and we think such a meeting is imperative. We believe that the bonds of affection which tie us to churches all across the world remain strong even if they are strained, especially with some churches in the global south. But even with those churches, we have many points of contact and shared ministry. Differences among Episcopalians are ours to resolve, and the spirit of the House of Bishops was respectful of differences. But we are also united in protecting the integrity of the Episcopal Church as an independent, autonomous and undivided Church. I ask you to continue to pray for our Church, for the Anglican Communion, for the Primates, for those who suffer oppression, for the poor, the needy and for all who seek the redeeming love of Christ. BB NOTE: Funny, he doesn’t mention that he voted against Resolution #1 and Resolution #3. Foreign prelates? I have never, in all my years of knowing Bishop Lee, ever hear him use a phrase like that. It doesn’t even sound like him. IN fact, this entire “letter” doesn’t sound like him. But foreign prelates? Is he really calling the Archbishop of Canterbury a “foreign prelate?” Is the Archbishop of York a “foreign prelate” too? Is the Presiding Bishop of Scotland also a “foreign prelate” too? After all, we got our own bishops through Scotland. Oops. And guess what – the Episcopal Church Presiding Bishop Katharine Jefferts Schori was one of those who gave thumbs up to the Communique. Is she a “foreign prelate” too? Why go write communiques with foreign prelates – did she think it was just for tea and crumpets? In fact, wasn’t she was telling her staff at 815 quite a different story when she got back from Tanzania than she’s telling now? What’s up with that? More later … Got to catch a train. LATER: The more we look at this so-called letter from the Bishop of Virginia, the more we think it’s actually a legally-crafted document and has nothing to do with reality but with crafty legal strategy. This letter doesn’t even sound like the Bishop Lee I’ve known for twenty years – and it’s interesting how the letter namechecks a good friend here, what’s that all about? The constitution does not say The Episcopal Church is autonomous – it says that it is “a constituent member of the Anglican Communion.” What does “constituent” mean? It means “Serving as part of a whole; component; one of the portions into which something is regarded as divided and which together constitute a whole.” The Windsor Report defines TEC as having “torn the fabric of our communion at its deepest level.” That’s what happens when one acts unilaterally. We are not “a self-governing, autonomous church…that it is not divided.” We are an element, a section of a whole that is the Anglican Communion. We are not independent – together we should constitute a whole – interdependence – but that wholeness is being torn asunder by the belligerent and unilateral actions of the Episcopal Church. 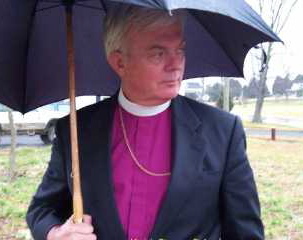 Bishop Lee knows this – it appears he voted his conscience at the House of Bishops meeting. Why did he come home then and write this thing? Who is running the Diocese? David Booth Beers? This letter is not for the Diocese, make no mistake about it. No wonder Ephraim Radner is grieved. <>Funny, he doesn’t mention that he voted against Resolution #1 and Resolution #3.<>I’ve been looking for a record of the voting; can you point the way? Is it just me, or does anyone else read these statements and find that their brain goes into “Midwest Conservative Journal” fisking mode?How can he say TEC is undivided without his nose doing the Pinocchio thing? Hmmm. My original primate was a foreign Jewish carpenter. I like him (and many foreign primates today) much, much better than I like most of the domestic kind. I see the legal strategy in all this. He can’t acknowledge that there is a division (like the 15 churches he is suing) because then Virginia Code § 57-9 is easier to use by the churches to keep the property.